When the stresses and mundanity of modern life have gotten the best of you and you just need to get away from it all, there’s nowhere quite like the beach. Beaches are the simplest places on the planet, offering nothing but sun, sea, and sand, but the simplest things in life often provide the greatest pleasures, and beaches give us all we need to have a great time. There are a lot of dream beach destinations all over the world, with Hawaii standing out as one of the best. The Aloha State, made up of multiple islands of different sizes, boasts a long list of world class, picture perfect beaches for all to enjoy. There are plenty of breathtaking beaches to be found all around the islands of Hawaii, but if you’re looking to enjoy the islands’ beaches while also getting an authentic taste of Hawaiian culture, cuisine, and nightlife, Honolulu is the place to be. The capital city of Hawaii, Honolulu is found on the island Oahu, on the southern coast. Honolulu is quite simply one of the prettiest cities on the planet, with a stunning skyline, mind-blowing beaches, and the warmest, bluest waters for swimming, snorkeling, surfing, and more. In terms of beaches, Honolulu has a lot to offer. The city is home to some of the most famous beaches not just in Hawaii, but in the entire world. What’s more, Honolulu’s beaches are all conveniently located close to the city itself, with lots of super nightlife spots, varied stores, fine dining restaurants, and more only a short walk away from the soft sands of each beach. Read on to learn more about Honolulu’s most popular beaches. As with many Honolulu beaches, Sunset Beach can offer a very different experience depending on the time of year you happen to be visiting. If you're at this beach in the winter months, you'll be able to sit back and admire the skills of some of the world's best surfers riding some crazy waves, but if you're at Sunset Beach in spring or summer, the waters are much gentler and ideal for swimming and snorkeling. The 2-mile beach offers a lot of space for beach games, picnics, and relaxing sunbathing sessions too, and it's also one of the safest beaches in the area, with lifeguards on duty all through the year. The golden sands and shimmer waters of Ke Iki Beach are beyond breathtaking. If you try to imagine a perfect beach in your mind, it probably looks a lot like this one. With captivating views in every direction, Ke Iki Beach is highly popular for both surfing and swimming, depending on the waves, and it's also one of the most untouched beaches of Honolulu, without any amenities. This means you'll need to bring your own food and beach equipment, but there are some stores and eateries just a short drive away if you need them. Ke Iki Beach is one of the best places in all of Hawaii to watch the sunset. Up on the north shore, Waimea Bay is one of the most famous beaches in the world. Attracting the planet's most talented surfers, this beach can serve up some of the craziest waves in all of Hawaii, especially in the latter months of the year. When the waters are choppy and the waves are high, the water is best-suited for surfing, but it gets much calmer in the summer and can be super for people of all ages to paddle, waddle, swim, and splash around. It's a beautiful beach with golden sands and a lively atmosphere, and there are some good amenities here too like clean showers, restrooms, and picnic tables. Definitely one of the most popular and well-known beaches in Honolulu, Ehukai Beach Park is perhaps most popular with surfers. It's home to the Banzai Pipeline, which is a name that any surfing enthusiasts will be familiar with, and sees some mega waves on windy days. The beach itself stretches out a long way in both directions, offering plenty of place to hang out with the crowds or find a more secluded spot to listen to the waves. Amenities include restrooms and showers, with bars and eateries only a short walk away too. Even if you're not a surfer, it's a lot of fun to sit on this beach and watch pros and amateurs alike riding the waves. 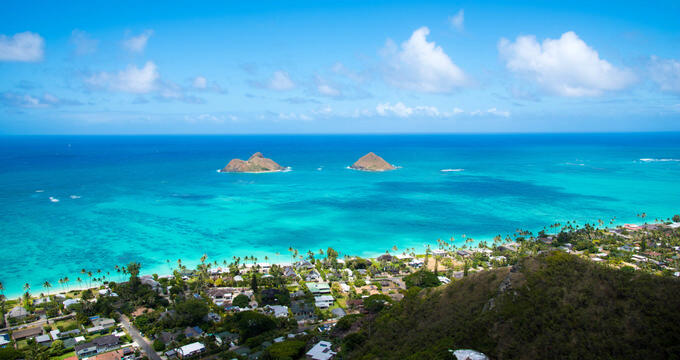 Running for around a mile in total, Lanikai Beach stands out for its waters and views. The sea here is the prettiest shade of blue you could ever hope to see and the relatively gentle waves provide perfect conditions for swimming and snorkeling, with kayaking also a popular activity on this beach. There's a coral reef a short way off the shore if you're in the mood to dive down and check out the local marine life, and a couple of picturesque islands can be admired off in the distance, making this beach a great place to snap some photos.